This is a medium-sized, migratory, fritillary butterfly. The wingspan is 1¾″ to 2½″. Females can be much larger than males. The upper side of both wings are orange with dark brown bands and spots. On the outer margin there is a band (marginal band) of orange spots that have dark borders and are separated by heavy, dark veins. All of the spots are pale and distinct, even at the wing tip. There is an orange submarginal band with dark, round spots, and a pale orange median band with no spots. The veins in the submarginal band, median band, and base are dark and thin. The base of the forewing is reddish-orange. The outer edge has a thick, black border. There is a pale orange spot near the center with a thick, black border. There are two black chevrons closer to the body. The base of the hindwing is reddish-orange with some thin black markings. The underside of the hindwing is brown with thin, white veins; a wide, pale, postmedian band; a pale marginal band; and no conspicuous pale spots. 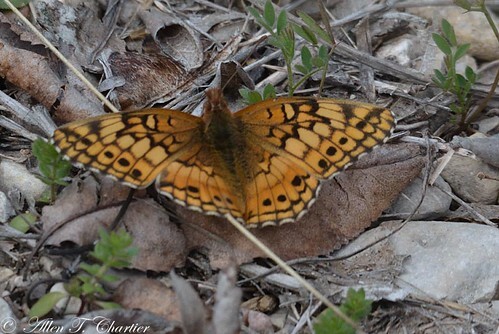 The underside of the forewing is pale orange with a reddish orange base, black markings, and a pale orange spot rimmed in black in the forewing cell. The caterpillar is orangish-red, shiny, and up to 2″ long. Each abdominal segment has a white, footprint-shaped spot at the middle of the upper (dorsal) surface. On each side of each segment there is a dorsal row, subdorsal row, and spiracular row of black with white spots. Each of these rows has a single, branched, spike-like projection (scolus). There are two longer scoli on the prothorax that project well forward of the head. The scoli are black with an iridescent, purplish-blue reflection. Violet (Viola spp. ), flax (Linum spp. ), plantain (Plantago spp. ), Canada moonseed (Menispermum canadense), and May-apple (Podophyllum peltatum). Nectar of dogbane (Apocynum spp. ), milkweed (Asclepias spp. ), aster (Symphyotrichum spp. ), beggarticks (Bidens spp. ), thistle (Cirsium spp. ), narrow-leaved purple coneflower (Echinacea angustifolia var. angustifolia), fleabane (Erigeron spp. ), boneset (Eupatorium spp. ), alfalfa (Medicago sativa ssp. sativa), red clover (Trifolium pratense), ironweed (Vernonia spp. ), Joe Pye weed (Eutrochium spp. ), purple loosestrife (Lythrum salicaria), and bog Labrador tea (Ledum groenlandicum). Adults migrate from the south, first appearing in Minnesota around mid-June. The female lays pale green or cream colored eggs singly on the leaves and stems of host plants. The larvae eat the leaves, stems, and flowers of host plants. There are usually two broods per year, sometimes three. Adults migrate south in the fall. They overwinter as caterpillars and possibly also as adults in frost-free areas. This "hungry, hungry caterpillar," the larval stage of the Variegated Fritillary butterfly, makes quick work of a delicious flower blossom. A male variegated fritillary tries to get it on with a female!